From playing chess with their children or billiards with foreign officers, to riding bicycles in the halls of the Winter Palace and spending days on tennis courts, Russian royals had a real passion for sports. What can one say about a country whose leader holds a title of Master of Sports in judo? President Vladimir Putin’s public image is one of a stark, competitive individual, and his sport of choice complements his political and media image. For Russian tsars public image was not very important, because they were not often seen by their subjects. Nevertheless, some of the tsars had passion for sheer competition, fitness and fun. Before Peter the Great, sporty stature wasn’t considered a virtue in Russia. In the 17th century, every nobleman, including the tsar, had to be a little overweight to show his material abundance and wealth. 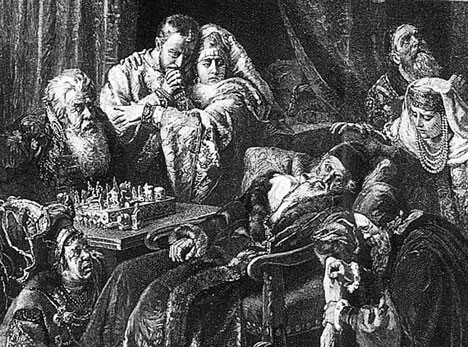 Probably the only contemporary sport game that medieval Russian sovereigns played was chess, the favorite game of the first Russian tsar, Ivan the Terrible. An English diplomat Jerome Horsey witnessed Ivan’s last chess game. In the evening of the last day of his life, Ivan sat in his bed for a game of chess with one of his boyars. Before the game started, the tsar himself managed to set up all his pieces on board, except for the king, which Ivan couldn’t place firmly, so he had to use his servants’ help. Minutes after that, Ivan fainted and died, still playing the game of chess. Chess was also a popular game among the first Romanovs. Tsar Alexis, the father of Peter the Great, ordered numerous beautifully crafted chess boards from abroad, so his son learned the game in his youth. It was Peter who really introduced sport as a means of entertainment and exercise into Russian royal family. Peter was familiar with the European way of life since his youth, when he frequented the German area in Moscow. In German taverns Peter learned to play the game of druck-tafel, a hybrid of pool and bowling. Later, when Peter was in the Netherlands, he got a billiards table as a gift from the Dutch king. 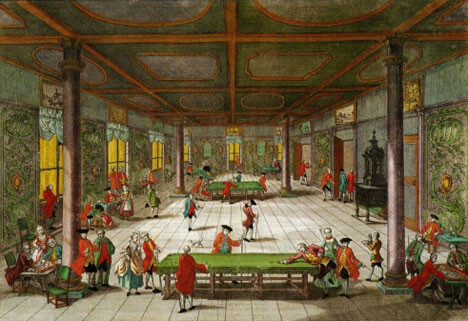 Peter installed the table in his waiting room to keep his guests busy, and, following the tsar’s example, many noblemen also started playing billiards. In 1718, a tsar’s decree established billiards as a compulsory game for the nobility’s evening parties, while playing cards was banned. Peter’s daughter Elizabeth, who ruled Russia for 20 years, was very concerned about her physical beauty, so to stay fresh and young, she practiced rowing and horseback riding, which helped her to keep a straight bearing and graceful pace. The next empress, Catherine the Great, also engaged in horseback riding to some extent, but it was her grandson, Nicholas I, who grew up to become a real athlete. Emperor Nicholas I, who was 6’2 feet tall and exceptionally strong, used to take part in chivalrous competitions modeled after medieval knight tournaments. During them, Nicholas wore armor so heavy that at one time, his nose started bleeding because of high blood pressure and overall tension. Nicholas understood the assets of sport for the young, so he organized gymnastic grounds for his children on the seashore in his estate in Peterhof. 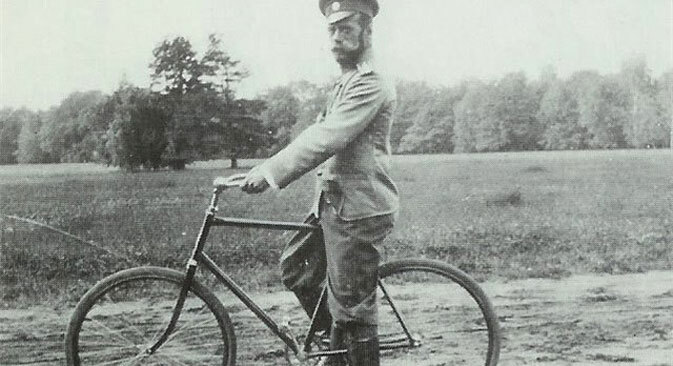 Nicholas’s elder son, Alexander II, was the first of Russian royal to take up cycling. He got his first bicycle in 1867 in Paris. For a 50-year-old tsar, this was a mere toy, but his sons, teenage princes Sergey and Pavel, really developed a passion for cycling. They rode their bikes in winter in the halls of the Winter Palace. Their bikes had solid rubber tires and produced an enormous racket, but nobody could reproach the princes for having their fun. By the end of the century, almost every member of the royal family owned a bicycle, and long fitness rides became a usual royal pastime. The last emperor of Russia, Nicholas II, was perhaps the most avid sportsman of all Russian tsars. He took up cycling at an early age, and, as we can see from his bills, regularly repaired and maintained his bikes. But Nicholas’s great passion was lawn tennis. He first got real sight of the game during his visits to England in 1890s, and soon began playing almost every day. 5 tennis courts were set up in different royal estates, and the tsar’s favorite game soon became widely popular among the nobility. One of tsars’ prime tennis partners was Felix Yusupov, later known as one of Rasputin’s assassins. Yusupov was trained in tennis on the lawns of Oxford, and his elder brother was one of Russia’s top players, so he could play better than Nicholas. But Felix cleverly lost a few games, which pleased the emperor and earned Yusupov a marriage to Nicholas’s niece. During the last years of the Russian Empire, Nicholas continued playing tennis and cycling – maybe it helped him put up with the enormous pressure of those times. His last bill to a bicycle repair man was written on May 10, 1917; and his last tennis games date back to the same month – even after the resignation, no longer an emperor, Nicholas stayed a keen sportsman. 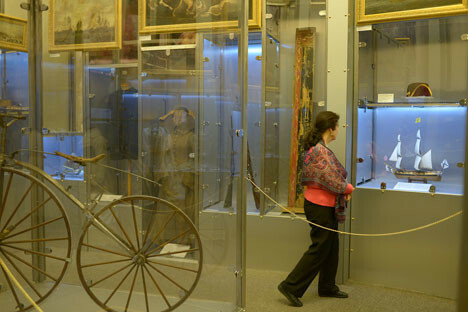 An exhibition dedicated to the sport hobbies of Romanovs is open in Sochi until March 23, 2014. On display are 300 unique exhibits from the museum funds of The State Peterhof Museum Reserve, including Catherine the Great’s horse saddle, Nicholas the First’s chivalry tournament goblet, and Alexander II’s first bicycle.